two recent twitter posts made me realize the strange similarities between the documentation of the sunset strip by ed ruscha and the documentation of the berlin wall in east germany. see rob walker’s post on ruscha as proto-google street view on design observer, here (link via @loudpaper) and this link to a video on the photographing of the berlin wall by east germany troops (link in german, via @maximolly), both in 1966.
the similarities in style and format—plus the coincidence in time—make a stark contrast to the differences in content. both sets document a linear void, the sunset strip and the void between the two walls—my german is almost gone, but from the images i can make out that the exhibition pairs images that seem to be looking at both sides from within the void. a sunday morning in california and any day within the void of the wall—the streets similarly empty of cars and people. ruscha had been researching deadpan, documentation-style photography for a few years by then, and his images looked for that aesthetic. 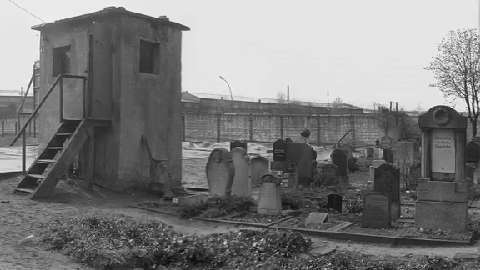 in contrast, the east germany documentation comes out as unexpectedly beautiful, both chilling in what its representing and engaging in its careful look at buildings, streets, and graves (a quick image in the video compares them to the becher’s photographs). the wall is a constant, but the images jump—they are moments along the line. in ruscha the only constant is the invisible presence of the pick-up truck and the formal construction of the images as continuous. as walker observes, google street view is now intent on representing every building on the planet—but i like to think one morning in los angeles and berlin, a california artist and a german soldier were both thinking of the linear void in their respective cities. did one think of the other? did the soldier think about the unexpected beauty of his images? did ruscha think about the split, the mirror line that would be implied in his reverse display of the photographs? did los angeles think about the division happening in berlin? i once visited a friend’s friend in east berlin. she grew up listening to american music, dreaming of the other side of the wall. it was bad music—she played some for us—but it had a completely different meaning for her. she had built this whole image (distorted, she now knew) of the united states based on those tunes. should we start documenting sections of streets, across the void instead of along it? i mean this in several ways. or has google pre-empted further attempts at street documentation—made us lazy? what both photographs from the 60s tell us is that even documentary photography, trying to be anonymous and deadpan, shows a particular intent. i’d like to see both works exhibited in the same place. pps. also relevant, chantal mouffe. according to mouffe, a work of art either “contributes to the reproduction of the given common sense” or “contributes to the deconstruction or critique of it.” mouffe’s point is that either way, all works of art are political, but but how do these works come out if we use mouffe’s choices? this is perhaps their greatest similarity, that in their insistence on being neutral, they stand nearer the first, rather than the second option—by avoiding critique, they become complicit with the situation that created the landscape they document. of course i do not expect critique from a soldier asked to record the surroundings of the berlin wall, but ruscha’s case is more complicated. is his silence a critique in itself? the empty street, the formal construction of linearity, all become part of the artistic apparatus that ruscha both erects and hides in plain sight. i once read he’s still photographing the strip, even now. i’d like to think he is, and that one day in the distant future he will reveal his final work—the ultimate documentation, across time and space, of the strip throughout his life. this act of stubborn work could be the critical stance that the book sometimes seems to lack.